The ARTHUR Web site is the online companion to the popular ARTHUR television series airing daily on PBS Kids. Like the show, the site targets kids between the ages of four and eight. It supports the same educational goals as the program: literacy and the modeling of positive social and problem-solving skills. The ARTHUR Web site first launched in 1996, and was originally conceived as a place where kids could interact with Arthur's World and the characters that inhabit it. The strength of that original concept was confirmed during user research in preparation for a major site redesign in 2001. That redesign led to a strengthening of this character-based approach, and a redefinition of the site's structure into one that young users can navigate easily and independently. 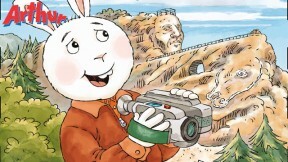 Postcards from Buster features recipes from Arthur’s friend Buster Baxter, who has traveled the globe with his dad, Bo Baxter.